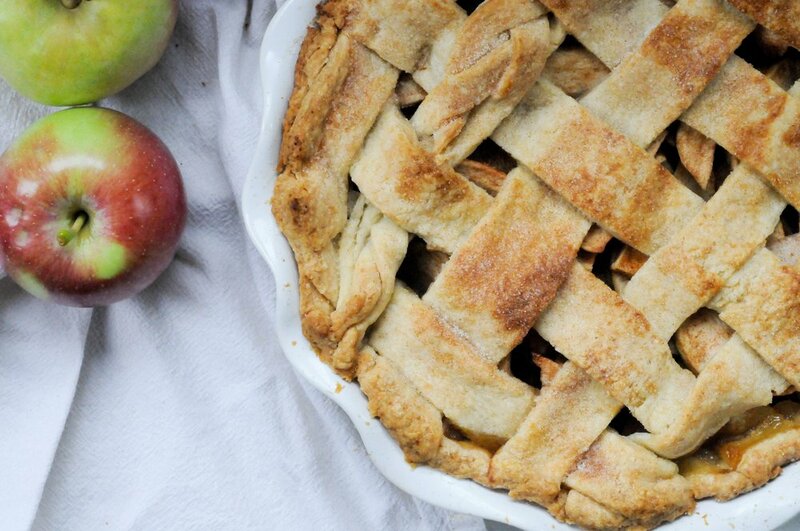 Classic Apple Pie — urban. apron. My parents moved closer to St. Louis over a year ago and although we miss our childhood home, my parents now live near the best apple orchard EVER. It’s small, private, simple, and the trees are loaded with gorgeous apples. We picked Empire and Fuji apples last weekend. 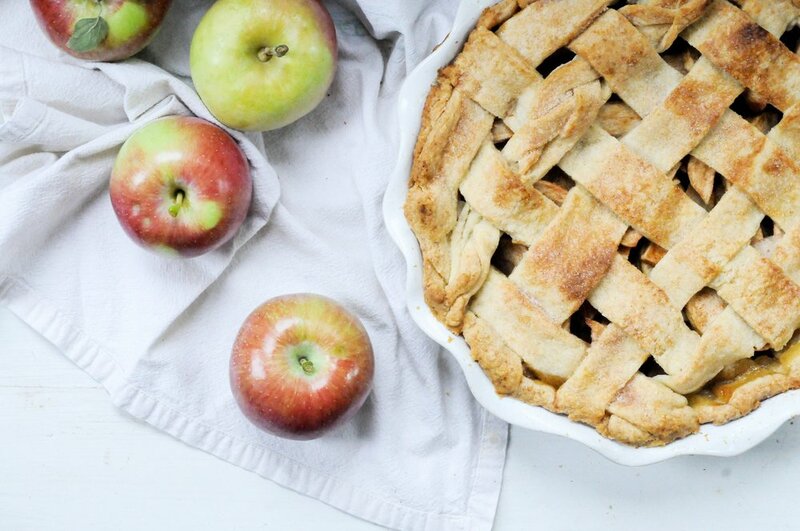 Since empire apples are great baking apples… I had to bake a pie. Yes, had to. Does anyone else get that feeling to bake something for no reason whatsoever other than you feel you must? That’s the baking pull right there. Trust your gut. Bake the pie! Homemade pie crust may seem daunting, but I literally just pulse the butter, flour, sugar and water in the food processor, press the dough into two discs, wrap in plastic wrap and stick it in the fridge as I make the filling. It takes minutes. (And it may be messy if you’re like me and rush through it.) But trust me, pie is very forgiving. Sometimes I overwork the dough or I don’t chill it for the 30 minutes I should. And you know what? My pie is always just fine. In fact, it’s imperfectly perfect. And tastes great. That’s all that matters. Oh, and a pro tip I just started doing is dusting the top with a cinnamon and sugar mixture. My husband’s grandmother does this and after eating a slice of her pie this past summer, I wondered why I never thought of dong it! It gives the crust a hint of sweetness and crunch. Thanks, Grandma Beck! This recipe is a classic. No frills. No complication. Just pie. You can also find the recipe up on St. Louis Magazine. Make the pie crust: In a food processor, pulse the flour, sugar and salt to combine. Add the butter and pulse until it is coarsely incorporated, with few pieces remaining. Drizzle in the cold water and then pulse until the dough crumbles, but it holds together. If it is too dry, add more water, 1 tablespoon at a time. Pulse a few times - don't over mix the dough! (You can also use a pastry cutter or forks to cut in the dough to mix, instead of a food processor.) Pour the dough onto a pastry slab or floured surface and form into 2 round discs. Wrap in plastic wrap and chill in refrigerator until ready to use, at least 30-60 minutes. You can even let it chill overnight, just let it soften slightly before rolling. This will make a double crust for a 9-inch pie. Make the filling: Place the sliced apples in a bowl. Add in the flour, sugar, spices and salt and mix. Assemble the pie: Roll out one disc of the pie dough on a floured surface. Place in the bottom of a 9-inch pie shell and press it down all around and up the sides. Pour the apple mixture into the pie shell. Dot with the 1 tbsp. butter, crumbled/cubed. Roll out the remaining disc of dough in the same manner. Either drape over the apple filling or slice into strips to make a lattice design. Fold or trim the pie overhang and crimp the edges. Brush the top of the pie with a little water, then sprinkle with a cinnamon-sugar mixture. Transfer the baked pie to a wire rack to cool completely, at least 4 hours, or up to overnight.